Sally Ride, the first female American to go to space, hid her sexuality over fears it would hurt her professional life, it has been revealed. Ride entered space on the Challenger shuttle in June 1983, becoming the first American woman and youngest ever American to do so. Following Ride’s death in 2012, it was finally made public that the former NASA astronaut had been in a 27-year relationship with female partner Tam O’Shaughnessy. O’Shaughnessy – who became CEO of company Sally Ride Science after Ride’s death – said they feared their relationship would harm the business. “Corporate America is really nervous about gay women. “When we started Sally Ride Science, we were just worried that it would affect the growth of the company, the sponsorships. Journalist Lynn Sherr, writing in her new biography of Ride, said: “Sally was very good at keeping secrets. 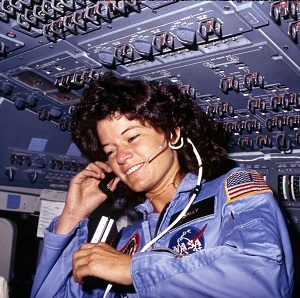 “There is no question in my mind that if Sally Ride had been openly gay and if she had applied to NASA, number one, she never would have been selected as an astronaut.